Was Mickey Hamill Belfast Celtic’s Greatest Player? This story is about one of Belfast Celtic’s greatest ever players – Mickey Hamill. My interested was aroused when I received a letter from Mr Pat Cassidy who lives in Causeway Street, Portrush. Mickey was born in Leeson Street down the Falls Road, the second youngest of a family of six, John, Pat, Joe and two sisters, Susan and Minnie. Mickey attended school at Barrack Street and Harding Street and it was mostly Gaelic games he played. I intend to tell you about his time spent with the two great Manchester sides and his seeming inability to stay any length of time in one place; he definitely had a touch of wanderlust in him. Mickey’s first teams were St Paul’s, Swifts and Belfast Rangers and it looked at one time as if he was going to sign for Distillery but Celtic jumped in and soon he was a regular ‘seconds’ team player. On a Good Friday in 1909 he got a run out in the senior side against Bohemians at inside right and made the spot his own. Christmas 1910 saw him give an exhibition in a holiday game against Glasgow Celtic after which a Man Utd representative stepped in and signed him. 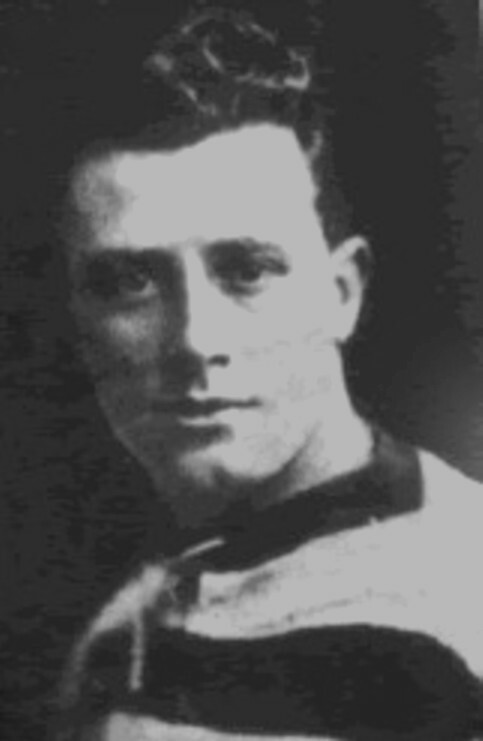 On December 31, United paid Celtic £175 for his signature and a clause was added that ‘United’ agree to play at Celtic Park in the Easter period of 1911. Pat Cassidy states that Mickey could not fit into the big city and had trouble acquiring lodgings. Pat claims the nuns in Belfast and Manchester placed him with temporary rooms with his great grandparents in St. Patrick’s parish in North Manchester. Mickey became attached to the Ball family and Bartle Ball, the head of the house, claimed Mickey became like a brother to his grandmother Catherine Ball and her six brothers and sisters. Pat says he believed Mickey returned to Belfast to avoid conscription in 1914 but returned in 1920 to play for Manchester City. Mickey settled happily again with the Ball family and a large photograph of Mickey wearing his International Cap stayed in the house for many years. Mickey was remembered with great affection and Pat says that his mother, the daughter of Catherine Ball, always spoke of Mickey Hamill as the “George Best of his day”. This information was given to Pat Cassidy by his great aunt Dorothea Ball who died a few years ago in her nineties. Dorothea and her husband Harry were contemporaries of Mickey Hamill and knew him extremely well and Pat would dearly love to find out more about Mickey Hamill who was like a member of his own family. My own knowledge is practically nil and when his name comes up in footballing company no one seems to know much more than his association with The Centre Half Bar at the corner of Paton Street and the fact that he was rated Celtic’s greatest ever player. That’s a huge statement when you consider the likes of Mc Alinden as F.A. Cup medal winner with Portsmouth, Charlie Tully, Bertie Fulton and a million more. I get the impression Mickey was a loner and despite the reputation he bears I think that seven ‘Caps’ is not a lot. He also had trouble making the Man United side where trainer Geordie Livingstone told him he was yards too slow for the Englishman’s faster paced type of game. He made him do 25-yard sprints until it seems Mickey got sick and tired of training. One of Celtic’s all time great wingers Stanley Mahood said he had never seen a finer or fitter athlete. Spectator’s used to gaze in awe as he skipped on to the pitch like a trotting pony, his stomach was like four tennis balls and the rest pure muscle and whipcord. After the war he played a season for Glasgow Celtic and won a League and Cup medal. He then signed for Man City for £2,000 a won a Cup finalist medal. His time at Maine Road was happy and the media had him billed as the ‘World’s Greatest’ centre half, a huge accolade for an Irishman in England. The wanderlust streak once again brought him back to his beloved Belfast Celtic but Home Rule was on the boil and the sectarian strife ruled the city. In 1925 he married a woman named Genevieve and the couple immediately left for America where he played for Forth River, Massachusetts. In no time he became an icon in the same mould as Babe Ruth and was even invited to the White House. However he was soon back in Belfast, the year was 1926 and he retired in 1930 but had a short stint as manager of Distillery in August 1934. A few knick-knacks on his career included leading Belfast Celtic to their first Irish Cup triumph against Linfield at Grosvenor Park on April 4v 1918. He played for Ireland against Scotland in victory International at Ibrox Park on March 22 1919 and amused the crowd with his yells of ‘Celtic’s ball’ at throw ins. However the scribes in Glasgow described his playing ability as “just quietly effective”. The only way I can give an opinion on Hamill’s ability is that my late father always said Hamill was the best player he ever saw – that will do me. On a sad ending, Mickey Hamill’s body was taken from the river Lagan at Lisburn on 23 July 1943. I don’t think any verdict was ever reached on this accident. As I said, Mickey Hamill lived a nomadic quiet existence and all I can add is you don’t get to play for teams like Belfast and Glasgow Celtic, Manchester United and Manchester City or your country, unless you are one hell of a player. No matter what anyone thinks, Mickey Hamill is ranked among the all time greats and that’s how he is remembered – a legend.